It's not summer yet, but May in New Orleans definitely feels like it. It can be very warm and muggy, day and night. Don't expect to get chilly as you party on Bourbon Street. Visitors flock to the Big Easy for their signature wine and food event and Jazz Fest held in April or May. Country fans will hit the Bayou Country Superfest held Memorial Day weekend in Baton Rouge, about an hour away. Afternoon highs are on a run up as the month goes on. The early part of May tops out around 81 degrees Fahrenheit, but by Memorial Day the mercury has climbed to 86 degrees on average. 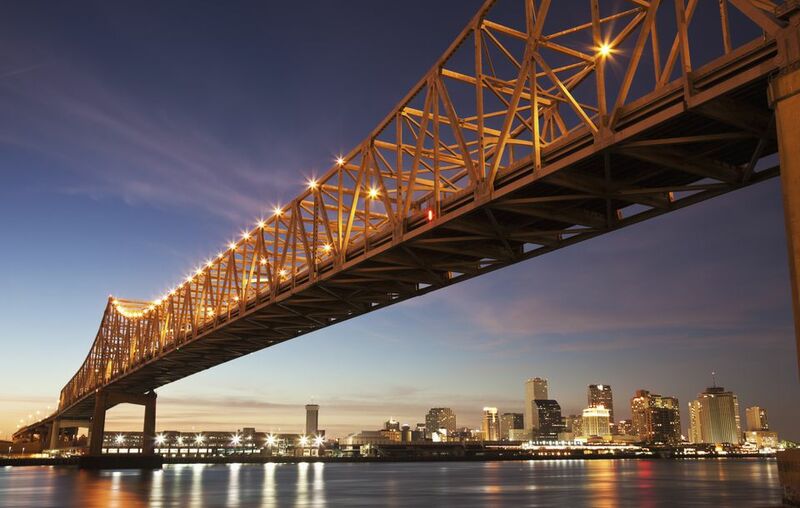 You won't need a sweater or jacket even if you stay up till dawn partying on Bourbon Street or getting down at the clubs on Frenchman Street; nighttime lows average 67 to 73 degrees as the month progresses. But anyone who has ever been in the Big Easy in warmer months will tell you that the temperature is not the whole story. One weather aspect makes a huge difference, and that aspect is humidity. The chances of it being not just warm but muggy are high in May, rising to virtually all the time by the end of the month. It's also cloudy and even overcast much of the time. And it rains a lot, too; NOLA generally gets about 5 inches of rain in May. All that said, New Orleans, is such a flat-out fun place to visit and hosts so many special events in May that you just have dress right, mostly ignore the weather, and find an air-conditioned respite if it's unbearable. The warm weather means your luggage gets a break: no thick sweaters, coats, scarves or boots needed. You'll have lots of room for several pairs of lightweight capri pants, khakis or shorts, which should do the trick for bottoms. Short-sleeved or sleeveless tops are the order of the day. Women should take along a skirt and cool top for dinners out if you plan on checking out New Orleans' top restaurants, and who would want to miss all that delish Cajun and Creole food? Take a lightweight wrap just in case the temperature dips lower than normal at night while you are there. Take sandals, sneakers or espadrilles to keep your feet as cool as possible; just be sure they can stand the walking you intend to do. Throw a collapsible umbrella or two in your bag for the inevitable rain or take a rain poncho if that's more convenient for you. There are two marquee events in New Orleans in May plus many other fun things to experience. The Jazz and Heritage Festival, known as Jazz Fest is a huge draw and runs late April through early May. It's not just jazz. It draws headliners in rock, pop, blues, zydeco, hip-hop, and funk. You'll hear A-list performers like Stevie Wonder, Tom Petty and the Heartbreakers, Harry Connick Jr., Snoop Dogg, Dr. John, and Leon Bridges. That's just a sample. 2019 brings The Rolling Stones as headliners. The Wine & Food Experience is a can't miss foodie experience held in either April or May. Since the early 1990s, the Wine & Food Experience has been tantalizing the taste buds of NOLA locals and visitors. Nearly 30 restaurants put on special dining evenings, and wineries go all out for tasting events, with 1,000 wines to try from around the world. (You can't try them all or they would have to carry you home, but you won't want for variety.) Promenades through the French Quarter add to the festive scene, and seminars add culinary and wine knowledge to the event. You can buy packages that include various events or tickets for single events. Cinco de Mayo is a time to celebrate with a Mexican flair. Cinco de Mayo, which commemorates the Mexican victory against the French during the Battle of Puebla on May 5, 1862, is a great excuse to remember the colonial past that Louisiana shares with Mexico and enjoy a margarita or two. Mexican restaurants and bars go all out with fiestas, food, and drink centering around May 5th. Bayou Boogaloo, with lots of live music, art and food, draws music fans to Bayou St. John. There are fun activities like paddle boat races and a bicycle pub crawl. The event strives to have minimal impact and suggests participants ride their bikes to the party and even offers "cash for trash" to encourage the pick-up of recyclables. Bayou Country Superfest, now in its tenth year, is a must for country music fans visiting the New Orleans area. The country music festival is held Memorial Day weekend at Tiger Stadium in Baton Rouge.